Nothing beats the exceptional look and quality of our German Shepherd Pillow. Among the finest made, you will be provided with great satisfaction and long lasting enjoyment. Why not pamper yourself or give a loved one a German Shepherd gift to show them how much you care. The German Shepherd Pillow will make the perfect gift for any German Shepherd lover. Shop with confidence, because all products come with a 100% customer satisfaction guarantee. Click over now to see the big selection of German Shepherd gifts we offer. 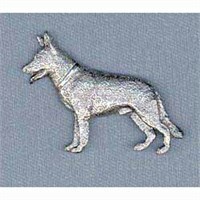 Nothing beats the exceptional look and quality of our German Shepherd Pin. Among the finest made, you will be provided with great satisfaction and long lasting enjoyment. Why not pamper yourself or give a loved one a German Shepherd gift to show them how much you care. 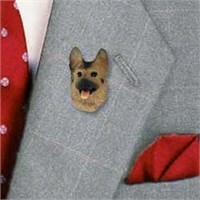 The German Shepherd Pin will make the perfect gift for any German Shepherd lover. Shop with confidence, because all products come with a 100% customer satisfaction guarantee. Click over now to see the big selection of German Shepherd gifts we offer. 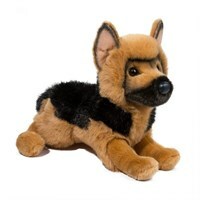 Nothing beats the exceptional look and quality of our German Shepherd Plush Animal. Among the finest made, you will be provided with great satisfaction and long lasting enjoyment. Why not pamper yourself or give a loved one a German Shepherd gift to show them how much you care. 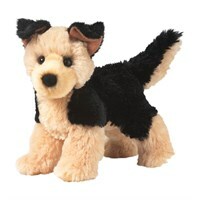 The German Shepherd Plush Animal will make the perfect gift for any German Shepherd lover. Shop with confidence, because all products come with a 100% customer satisfaction guarantee. Click over now to see the big selection of German Shepherd gifts we offer. You will love the fine detail and clever way this German Shepherd Portrait captures all the best features and spirit of your favorite friend. Our DGerman Shepherd Portrait will look great displayed on your wall at work or on a mantel at home. Perch this next to a framed photo and you?ÇÖll have an instant focal point in your living room. Our delightful German Shepherd Portrait is made of stone resin and are hand painted to feature exceptional detail. This fine Collectible measures 9" x 11" inches in size. Nothing beats the exceptional look and quality of our German Shepherd Sign. Among the finest made, you will be provided with great satisfaction and long lasting enjoyment. Why not pamper yourself or give a loved one a German Shepherd gift to show them how much you care. 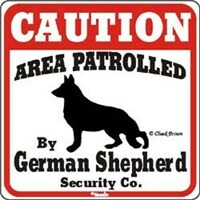 The German Shepherd Sign will make the perfect gift for any German Shepherd lover. Shop with confidence, because all products come with a 100% customer satisfaction guarantee. Click over now to see the big selection of German Shepherd gifts we offer. Nothing beats the exceptional look and quality of our German Shepherd Socks. Among the finest made, you will be provided with great satisfaction and long lasting enjoyment. Why not pamper yourself or give a loved one a German Shepherd gift to show them how much you care. The German Shepherd Socks will make the perfect gift for any German Shepherd lover. Shop with confidence, because all products come with a 100% customer satisfaction guarantee. Click over now to see the big selection of German Shepherd gifts we offer. This German Shepherd Stuffed Plush Animal is Stuffed with cuteness, adorableness and sweet, sweet dreams! When you receive your German Shepherd Stuffed Plush Animal you will be taken aback with how wonderfully it is made (we use the finest materials) and how much it seems to beg to be held. The German Shepherd Stuffed Plush Animal measures approximately 16" inches. 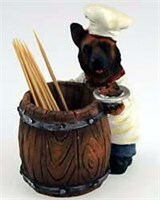 Nothing beats the exceptional look and quality of our German Shepherd Toothpick Holder. Among the finest made, you will be provided with great satisfaction and long lasting enjoyment. Why not pamper yourself or give a loved one a German Shepherd gift to show them how much you care. The German Shepherd Toothpick Holder will make the perfect gift for any Dog lover. Shop with confidence, because all products come with a 100% customer satisfaction guarantee. Click over now to see the big selection of German Shepherd gifts we offer. Our German Shepherd Tote Bag makes a wonderful accessory for anyone who shares the energy of the German Shepherd, and is always on the go. 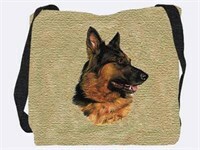 The marvelous lifelike portrait on both sides of these 17" X 17" German Shepherd Tote Bags instantly marks you as an enthusiast of discerning tastes, and you will get years of use out of its high quality, machine washable 100% cotton construction. Our German Shepherd (Puppy) Tote Bag makes a wonderful accessory for anyone who shares the energy of the German Shepherd, and is always on the go. The marvelous lifelike portrait on both sides of these 17" X 17" German Shepherd Tote Bags instantly marks you as an enthusiast of discerning tastes, and you will get years of use out of its high quality, machine washable 100% cotton construction. Nothing beats the exceptional look and quality of our German Shepherd Umbrella. Among the finest made, you will be provided with great satisfaction and long lasting enjoyment. Why not pamper yourself or give a loved one a German Shepherd gift to show them how much you care. The German Shepherd Umbrella will make the perfect gift for any German Shepherd lover. Shop with confidence, because all products come with a 100% customer satisfaction guarantee. Click over now to see the big selection of German Shepherd gifts we offer. Nothing beats the exceptional look and quality of our German Shepherd Video. Among the finest made, you will be provided with great satisfaction and long lasting enjoyment. Why not pamper yourself or give a loved one a German Shepherd gift to show them how much you care. The German Shepherd Video will make the perfect gift for any German Shepherd lover. Shop with confidence, because all products come with a 100% customer satisfaction guarantee. Click over now to see the big selection of German Shepherd gifts we offer. Nothing beats the exceptional look and quality of our German Shepherd Weathervane. Among the finest made, you will be provided with great satisfaction and long lasting enjoyment. Why not pamper yourself or give a loved one a German Shepherd gift to show them how much you care. 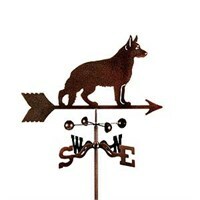 The German Shepherd Weather vane will make the perfect gift. Shop with confidence, because all products come with a 100% customer satisfaction guarantee. Nothing beats the exceptional look and quality of our German Shepherd Windchime. Among the finest made, you will be provided with great satisfaction and long lasting enjoyment. Why not pamper yourself or give a loved one a German Shepherd gift to show them how much you care. 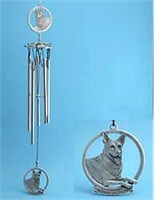 The German Shepherd Windchime will make the perfect gift for any German Shepherd lover. Shop with confidence, because all products come with a 100% customer satisfaction guarantee. Click over now to see the big selection of German Shepherd gifts we offer.